Artist's illustration of NASA's Cassini plunging into Saturn's atmosphere on Sept. 15, 2017. Cassini put up a good fight. The NASA Saturn probe fired its thrusters full bore for at least 91 seconds during its suicide plunge into the ringed planet on Sept. 15, battling hard to keep its antenna pointed at Earth for as long as possible, mission team members said. The $3.2 billion Cassini-Huygens mission — a joint effort of NASA, the European Space Agency and the Italian Space Agency — launched in October 1997 and arrived in the Saturn system on June 30, 2004. In January 2005, the piggyback Huygens lander touched down on the surface of the gas giant's largest moon, Titan. The Cassini mothership, meanwhile, continued orbiting Saturn, studying the planet, its iconic rings and its many moons. That work resulted in a number of important discoveries. For example, in 2005, Cassini spotted geysers of water ice and other material blasting from the south polar region of the Saturn satellite Enceladus. Mission scientists have determined that this stuff is coming from an ocean of salty water beneath the moon's icy crust — and that this ocean may be capable of supporting life. Cassini also identified lakes and seas of liquid hydrocarbons on Titan. Before this discovery, Earth was the only object known to harbor bodies of stable liquid on its surface. In addition, the spacecraft saw evidence of lots of complex chemical reactions occurring in Titan's thick, nitrogen-dominated atmosphere. Astrobiologists think Titan's surface might be habitable, though any life-forms that exist there would have to be very different from Earth's water-dependent organisms. Cassini couldn't keep looping around Saturn forever, however; eventually, it would have run out of fuel. And mission team members wanted to dispose of Cassini safely while they still had control of the spacecraft, to make sure it never contaminated Titan or Enceladus with microbes from Earth. So they steered Cassini toward Saturn on Sept. 15, sending the probe out in a blaze of glory. Cassini gathered and beamed home a great deal of science and engineering data during this death dive. It'll take a while to process the science information, but analyses of the engineering data have already allowed the mission team to reconstruct the orbiter's final moments, NASA officials said. These data include measurements detailing the performance of Cassini's small attitude-control thrusters, which the probe used to maintain stability for as long as possible during the plunge. "To keep the antenna pointed at Earth, we used what's called 'bang-bang control,'" Cassini spacecraft operations chief Julie Webster, also of JPL, said in the same statement. "We give the spacecraft a narrow range over which it can rotate, and when it bangs up against that limit in one direction, it fires a thruster to tip back the other way." Cassini was employing subtle and discrete bang-bang thrusts until it began to encounter Saturn's atmosphere, about 1,200 miles (1,900 kilometers) above the planet's cloud tops, NASA officials said. The Saturn air is very thin up there, but Cassini was going so fast at the time — about 77,000 mph (124,000 km/h) — that the wispy atmosphere had a sizable impact. Gas molecules pushed on the 36-foot-long (11 meters) boom for Cassini's magnetometer instrument, forcing it to rotate backward slightly. The spacecraft's thrusters fired more frequently in response, trying to keep the probe level. The battle continued and intensified, until the thrusters were firing pretty much continuously. This climactic stage lasted for at least 91 seconds, NASA officials said. "The final eight seconds of data show that Cassini started to slowly tip over backward," NASA officials wrote in the statement. 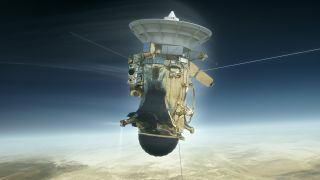 "As this happened, the antenna's narrowly focused radio signal began to point away from Earth, and 83 minutes later (the travel time for a signal from Saturn), Cassini's voice disappeared from monitors in JPL mission control."